A beautiful National Trust site and National Nature Reserve with lots of wildlife including otters. The water lilies flower in Spring and early Summer, but this is a beauty spot at any time of the year. An 18th century designed landscape, was created by the Earls of Cawdor, to provide a beautiful setting for their mansion. Three narrow valleys were damned to form lakes. Groves were planted, garden structures, walled garden areas and wilderness areas were created. The mansion was demolished in 1963, although structures such as an ice house remain. You can walk there from the National Trust car parks (toilets available) at Bosherston, Stackpole Quay, or Broadhaven beach. Milford Haven is a deep natural harbour – it is a drowned valley. Plenty of busy tankers, ships, tugs and other maritime vessels can be seen at the seaward end of the Haven. The upper reaches, by contrast, are very tranquil with ancient woodlands, saltmarshes, mudflats and sheltered inlets, ideal for Herons and other birds. Cresswell Quay or Lanshipping are good places to experience the Secret Waterway. You can also take boat trips up the estuary. The Green Bridge of Wales probably the most spectacular natural arch in the UK. There are steep cliffs and two impressive limestone stacks nearby. 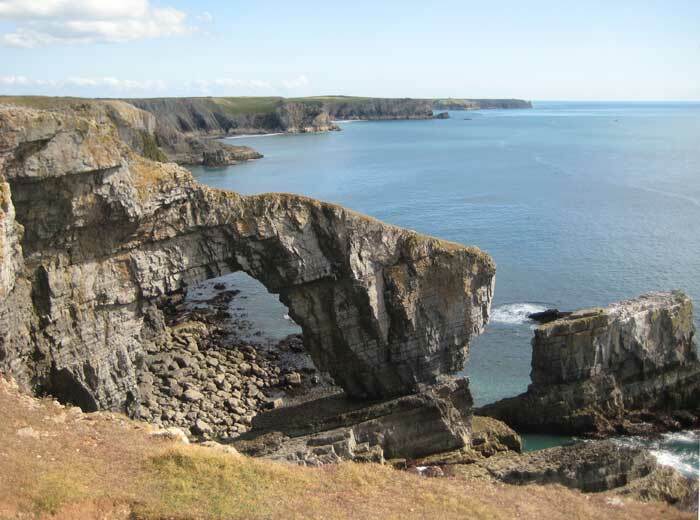 This section of rugged coastline also boasts the highest concentration of sea birds on mainland Pembrokeshire. In late summer/early Autumn you may see seals pupping on the beaches at Stack Rocks. Rolling unenclosed moorland in the north of Pembrokeshire with a wealth of prehistoric monuments including many standing stones. Blocks of Dolerite forming the bluestone circle at Stonehenge are said to have come from here. The Golden Way, along the main ridge of the Preselis, follows a Bronze Age trade route. You can enjoy views over to Ireland on a clear day.